To the time blogging is a most Powerful option for growing Career. Many People are earning money based only on blogging. Have a Big Question How to Start Blogging and how to set up a blog? 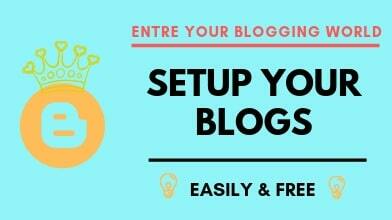 I will learn to you How to Setup your blogs. In this article, I will Teach you How to Create a Blogger account and Create a beautiful Blogs. Blogger is a Platform where You can Sharing your Knowledge to Writing your articles. Blogger is Developed by Google. In the Past Blogger is a Separate Platform and Then Google is Buy their Products. Now Blogger is fully Operate by Google. When a Create Your Own Blogs. Then You Choose ractive and SEO friendly Themesatt. I will Recommend Top 5 Blogger Themes. You Can Choose Your Own Themes that obviously relate your blogs Niches. Click Here Top button BACKUP/RESTORE on Corner to Your Blogger Dashboard. Click and Upload Your Themes on. XML file Format and Backup Your Previous Themes, When Corrupt Your Themes then You can Restore Your Themes this backup. Blogger Description is so Important Part to Ranking Your Blogs from Google Searches Engine. Then Submit Your Post >> Click on PUBLISH. Then Successfully Published Your Post.